"By worshiping the arca-vigraha, one can at once approach the Lord, who accepts the service of a devotee by His omnipotent energy. The arca-vigraha of the Lord descends at the request of the acaryas, the holy teachers, and works exactly in the original way of the Lord by virtue of the Lord's omnipotence. 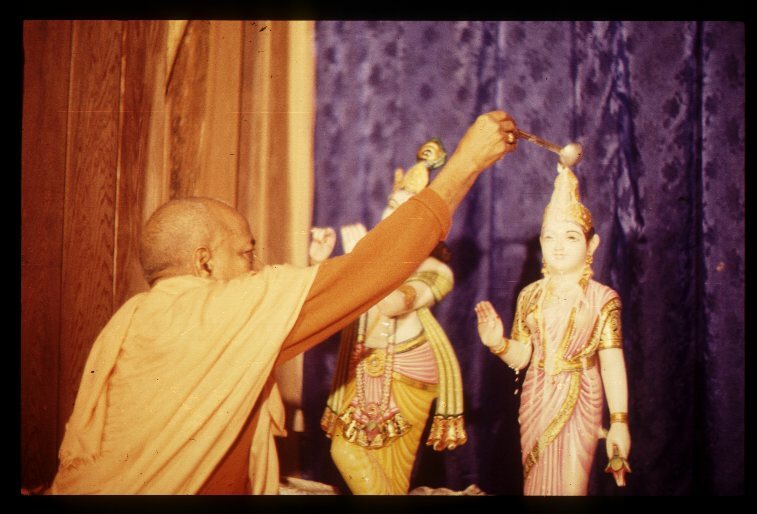 Foolish people who have no knowledge of Sri Isopanisad or any of the other sruti-mantras consider the arca-vigraha, which is worshiped by pure devotees, to be made of material elements. This form may be seen as material by the imperfect eyes of foolish people or kanistha-adhikaris, but such people do not know that the Lord, being omnipotent and omniscient, can transform matter into spirit and spirit into matter, as He desires."